Are you having trouble restoring all of your files to your iPad, iPhone or iPod touch? Now, with iBackupBot for iTunes you can select, view, and even modify files before you replace them on your handheld device. Every time you connect your iPhone to computer, iTunes starts backing up almost everything on your iPhone immediately. But sometimes, how to use the iTunes backup is a big problem. iBackupBot for iTunes lets you control how you backup and manage your iPad, iPhone or iPod touch data. If you use a Windows or Mac computer, you will be able to use your full-sized screen and keyboard to selectively manage your iPad, iPhone and iPod touch files. iBackBot for iTunes gives you the power to modify iTunes backed-up files. You’ll be able to do so much more than you were able to do before, and there’s no “jailbreak” required! Browse through all critical backup files and quickly find the ones you need. Share data easily with friends or export data to keep a backup copy. Transfer App data files from backup to iPad, iPhone or iPod touch directly. Remove a single call history record from your devices. Export an iTunes backup to a computer folder for use later. 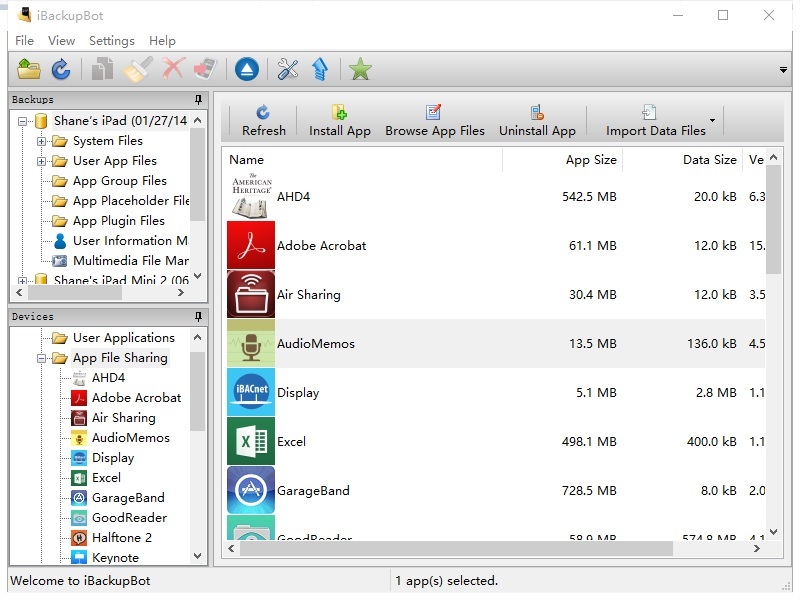 Transfer App data files from iPad, iPhone or iPod touch to computer directly. Backup Manager Software for iPad, iPhone, and iPod Touch. View, browse, export, and edit iTubes backed-up files. Built-in SMS Message Viewer allows you to view, export, delete SMS messages. Built-in Contact Viewer allows you to view, browse, and export contacts. 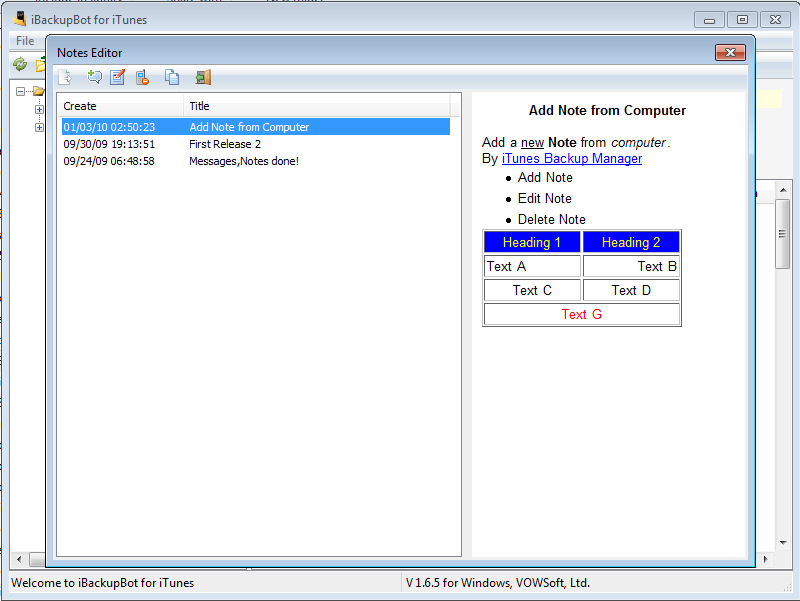 Built-in Notes Editor allows you to edit notes with HTML. Built-in plist Editor allows you to customize your device. iPad/iPhone/iPod Touch with iOS 2.0 or later. How does iBackupBot for iTunes Work? iBackupBot for iTunes is a tool that helps you browse, view, export and even EDIT files backed up to iTunes. When you connect your iPad, iPhone or iPod touch to your computer and select “Back Up”, certain settings and files from these devices are automatically backed up to your computer. You can restore this information if and when you need to. iBackupBot is especially handy when you purchase a new iPhone (or iPad, or iPod touch) and want to transfer your previous settings to it. The backed-up information includes text messages, notes, call history, contact favorites, voicemail and widget settings and more! iBackupBot even saves and transfers photos from your iPhone’s camera roll or your iPad and iPod touch. The functionality is spot-on, and since there’s no other way to get to things like SMS messages and Notes, you might find this a smart investment in data portability after all. The interface is concise and similar to File Explorer, so even beginners will not feel frustrated. It makes accessing iPhone backup on computer easier. If you want to transfer certain data from one iPhone to another iOS device via backup, it could meet your demand. And you can edit iOS backups made by iTunes within iBackupBot. What happens after I order iBackupBot?